The Cubot X6 Message Settings menu will let you adjust the way your messaging app works. You can set limits to both SMS and MMS. You can also set notifications, change chat wallpaper, delete old messages automatically, and more. From the Home screen, tap the Messaging app. Tap the Menu key, choose Settings. Request delivery report - this allows the user to request a delivery report for each message sent. Since Cubot X6 has two SIM card slots, tapping this option will allow the user to choose which SIM is allowed to request delivery report. Manage SIM card messages - this allows the user to manage text messages that are stored in SIM cards. Tapping the option will allow the owner to choose which SIM card he/she wants to manage messages. Edit quick text - this option allows the user to edit quick texts that are already stored in the phone or add new ones. By default, the Cubot X6 has 9 quick texts a user can choose from. SMS Service Center - this option allows the user to edit the SMS Service Center number for each SIM card. 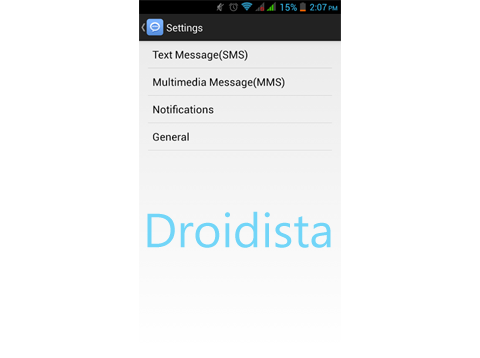 SMS storage location - the user can choose the location to store text messages for each SIM card. The options are Phone and SIM Card. Group messaging - when enabled, this option allows the owner to use MMS to send a single message when there are multiple recipients. Request delivery report - this allows the user to request a delivery report for each MMS message sent. Since Cubot X6 has two SIM card slots, tapping this option will allow the user to choose which SIM is allowed to request delivery report. Request read report - this allows the user to request a read report for each MMS message sent. Since Cubot X6 has two SIM card slots, tapping this option will allow the user to choose which SIM is allowed to request delivery report. Send read report - if the sender requests it, the phone will send a read report for ever MMS sent. Auto-retrieve - when enabled, message attachments will automatically be downloaded when you display a multimedia message. By default, this option is disabled so only message header displays in the message list. Under this option is Roaming auto-retrieve, which is basically the same as the Auto-retrieve, only that you're allowing your phone to download attachments even when roaming. Creation mode - there are three options you can choose from: Restricted mode, Warning mode and Free mode, which is selected by default. Size Limit - you can set limits to messages you receive. You have three options here, 100K, 200K, and 300K. The last is chosen by default. Priority - like any other smartphones, you can set priorities in your messages. You can set it on High, Normal or Low. Mute: you can mute notifications for 1, 4, or 8 hours. By default, this option was set to Off. Ringtone: you can choose a ringtone for new notifications. There is a lot of notifications to choose from (sorry I didn't bother to count) but there is no option to use custom ringtones. Vibrate: you can set the phone to vibrate when notifications are received. Popup notification: show popup for push notifications. Chat wallpaper - you can set your own chat wallpaper by choosing from your Wallpapers, Gallery, using the Default or Taking a photo. Message font size - you can set the size of the font in your messaging app. You have four options here: Follow system font size (default), Small, Medium, Large, and Extra Large. Show email address - you can set the phone to include email address when browsing through contacts. Delete old messages - when enabled, you need to set text message (SMS) limit and multimedia message (MMS) limit as old messages will automatically be deleted when limits are reached. By default, SMS limit is set to 500 messages per conversation or thread while MMS limit is set to 50. Cell broadcast - you can set each SIM card to broadcast cellular network. Enable WAP PUSH - put a check mark in the box to enable the phone to receive WAP PUSH. If you got some problems with your Cubot X6 smartphone, don't hesitate to contact us via harold@droidista.com and we will get back to you as soon as we can. You can also join in our Smartphone Support community powered by Google+ as we spend more time answering questions there. Talk to me through the chat widget at the lower-right corner of this page so I can help you with your problem. Samsung Galaxy S3 Problem: "Unfortunately, TouchWiz Home has stopped"